If you spend any time looking into creation-based curriculum, Apologia Educational Ministries is going to be a major player. 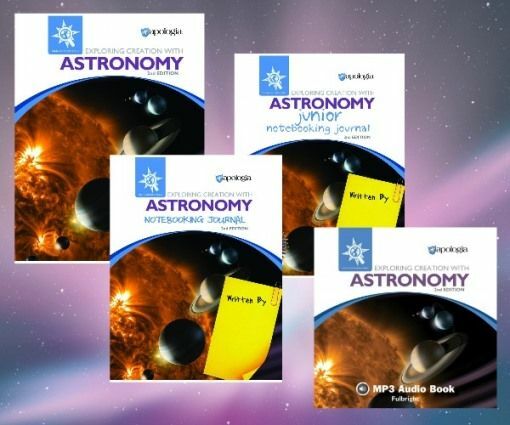 We had the pleasure to review Apologia's Exploring Creation with Astronomy, 2nd Edition and before the books even came in, I knew by reputation that we were getting high quality materials! Since my only serious study of astronomy was a super-boring class my freshman year of college and a couple of planetarium visits at the Science Museum, I was looking forward to something a little more interactive this time. Apologia was extremely generous in the number of resources they gave us and truly provided a very interactive and well-rounded educational experience. My son certainly liked it! 1) Student Text - A full color, nice quality textbook with professional photos, suggested activities, and a wealth of Bible references. 2) Notebooking Journal - This is an interactive tool that kids can take notes, illustrate their favorite concepts, and create all kinds of keepsake art. Intended for 3rd/4th grade students and up. 3) Jr. Notebooking Journal - This junior version is geared toward new readers and writers so there are more coloring pages and larger lines for writing. Intended for K - 3rd grade students. 4) Audio CD - This is a the audio recording of the text Exploring Creation with Astronomy read by Jeannie Fullbright. If you have auditory learners, slow readers, any learning disabilities, or just need to encourage some independent learning, this is a fabulous resource to engage with the content. We recently moved out of the metro and a little more into the country, but we hadn't taken much time to really enjoy the night sky. One of the first things we did after the curriculum arrived was head outside before bed with a set of binoculars. After the first night, miss Z would ask regularly to do it if we missed a night. This act alone was a great family experience and created lots of teaching moments about all kinds of things, not just astronomy. Every lesson has several scriptures highlighted throughout where astronomy doubles as Bible study! I love the beauty of God's wisdom and creation as a driving force in education. As I eluded to above, Apologia has produced a high quality curriculum that, from an educational standpoint, is top notch. Still, the most valuable part of this program, and likely from all of their products, is the constant demonstration and appreciation of God's power and will in the world around us.